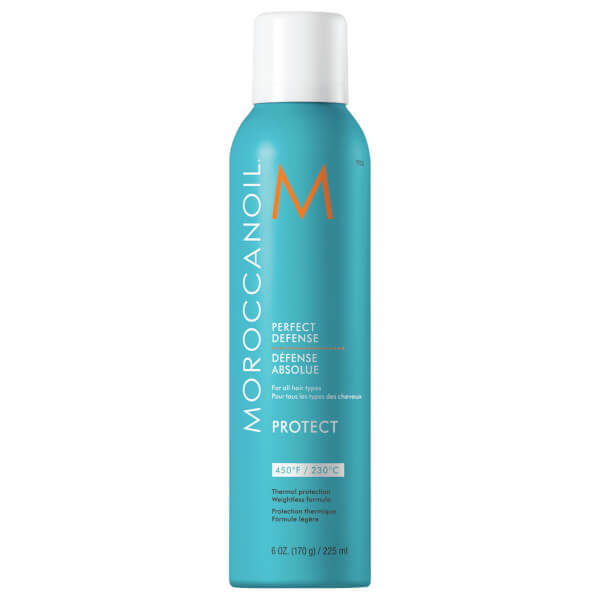 Achieve salon-worthy results from home with Moroccanoil's Perfect Defense; a weightless, dry aerosol that hydrates, conditions and shields hair from styling damage. Harnessing the powers of nourishing Argan Oil and Panthenol (Vitamin B5), the vitamin-rich mist delivers long-lasting moisture, whilst defending against styling tools up to a temperature of 230°C. Apply to wet hair for thermal protection, or use on dry hair for second-day touch-ups. For best results, use at the beginning of your styling routine before applying other products. Mist generously and evenly 15cm away from damp hair. Comb through and blow-dry. Style with a hot tool. Use on dry hair for second-day touch-ups. Dimethyl Ether, Sd Alcohol 40-B (Alcohol Denat. ), Aqua/Water/Eau, Butylene Glycol, Octylacrylamide/ Acrylates /Butylaminoethyl Methacrylate Copolymer, Argania Spinosa (Argan) Kernel Oil, Achillea Millefolium (Common Yarrow) Extract, Geranium Maculatum (Spotted Cranesbill) Extract, Lentinus Edodes (Shiitake Mushroom) Extract, Rosmarinus Officinalis (Rosemary) Leaf Extract, Salvia Officinalis (Sage) Leaf Extract, Parfum/Fragrance, Peg-40 Hydrogenated Castor Oil, Aminomethyl Propanol, Panthenol, Cetearamidoethyldiethonium Succinoyl Hydrolyzed Pea Protein, Glycerin, Tocopheryl Acetate, Ppg-12 Dimethicone, Hydroxypropyl Methacrylate, Benzoic Acid, Linalool, Alpha-Isomethyl Ionone.